Grand Place couverture chocolate has been developed for excellent taste according to traditional recipe and longtime experience of Safarian Chocolate company, Belgium. Grand Place couverture is widely arranged to prarine, truffle, bonbon chocolate, nama chocolate, cake and ice cream because of thick taste and melting texture. Grand Place couverture was originally blessed with rich taste and renewed in 2015 by large experience of works and production line was improved. 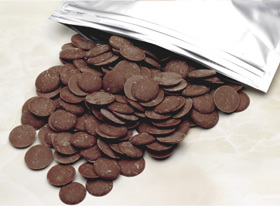 Excellent quality of chocolate is offered. Standard dark chocolate with good balance of cacao flavor and sweetness. 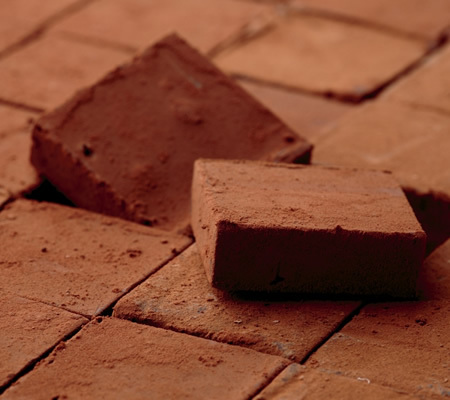 It is suitable for truffle, bonbon chocolate and cake base for highlighting cacao. ※F(Fondant) generally stands for dark chocolate in Europe. Traditional milk chocolate with Belgian milk and quality cacao. 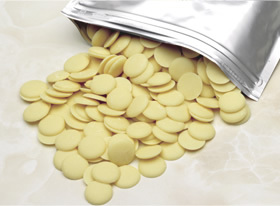 Selected Belgian milk, sugar and flavor rich cocoa butter create good balance of white chocolate. White chocolate ganache of framboise eau de vie. Dark chocolate ganache with flavor rich Negrita rhum. 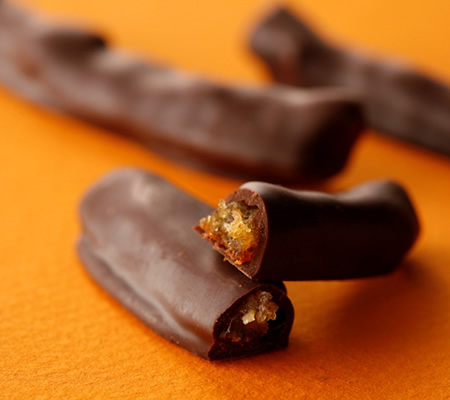 Milk chocolate ganache of elegant flavor with Grand Marnier. High flavored white chocolate ganache with German Kirsch. Milk chocolate ganache of elegant flavor of Orange Imperial. Soft flavored white chocolate ganache with pear puree and Poire William. Edel flavored dark chocolate ganache with Calvados. Japan imaged white chocolate ganache with selected Uji Maccha. Mellow flavored dark chocolate ganache with old vintage sake. White chocolate ganache of mouthful fresh flavor of Yuzu. Milk chocolate ganache with Orange dry liqueur. Milk chocolate ganache of fragrant harmony with Earl Gray tea. Dark chocolate ganache of mellow aroma cointreau. Melting milk chocolate ganache with maple flavor and Zubrovka. Selected coffee is blended in chocolate. Taste for adults. Fresh flavored milk chocolate ganache with mango and passion furuit. Rich tasted milk chocolate ganache with caramel and French Guerande salt. Milk chocolate ganache with precious Champagne JM Gobillard et Fils. Extra bitter chocolate ganache of 75% cacao. Milk chocolate ganache with marron paste and cognac. Hazel nut gianduia with crunchy texture of feuiletine. Ganache filled milk chocolate especially featured milk taste. Gianduia featured savory smell of coconut flake. Aroma rich praline chocolate of hazelnut and almond. Dice cut almond is covered with milk chocolate. Fresh taste imaged white chocolate ganache with lychee liqueur. Deep red colored chocolate with coffee imaged adults taste. Earl Gray flavored milk chocolate colored passionate red. Mild aroma of rosé champagne cream in light pink colored chocolate. White chocolate filled with champagne ganache for clear taste. Milk chocolate ganache with fresh white peach puree from Yamagata. Sweet aroma of honey from Wakayama and flower flavor. Harmonized two layers of milk chocolate jelly and ganache. White chocolate ganache with flavor rich maccha from Nisio Aichi. 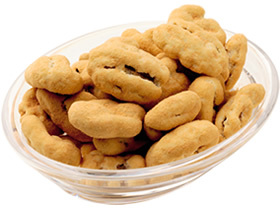 Light roasted pecan nut is coated with white chocolate and caramel powder. 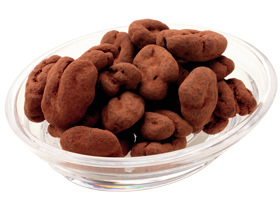 Light roasted pecan nut is coated with milk chocolate and cocoa powder. 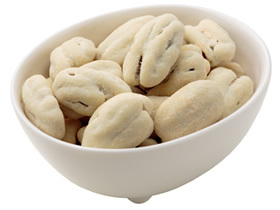 Light roasted ocean nut is coated with white chocolate and powdered Wasanbon from Tokushima. 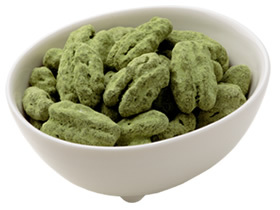 Roasted pecan nut is Kyoto maccha mixed white chocolate and powdered maccha powder. 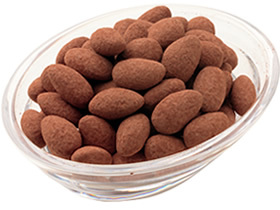 High quality almond is caramelized and coated with milk chocolate and cocoa powder. 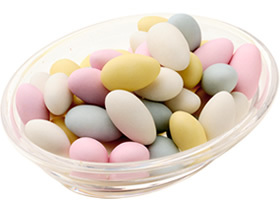 Almond is coated with white chocolate and natural colored sugar. 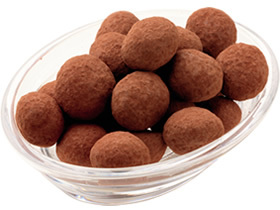 Large size macadamia nut is coated with milk chocolate and cocoa powder. 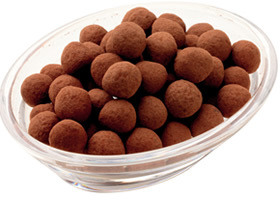 Large size macadamia nut is coated with milk chocolate and sugar powder. 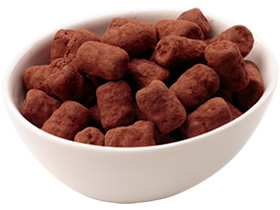 Small size fluffy marshmallow is coated with milk chocolate and cocoa powder. 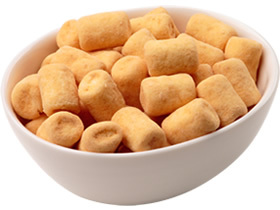 Small size marshmallow is coated with white chocolate and caramel powder. 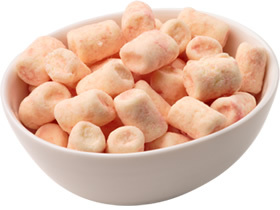 Fluffy small size marshmallow is coated with white chocolate and finished with strawberry powder. 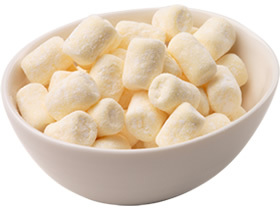 Small size marshmallow is coated with white chocolate and sugar powder. 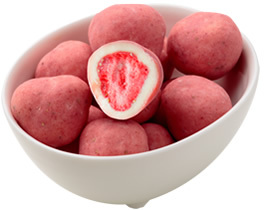 Freeze dried strawberry is coated with white chocolate and strawberry powder. 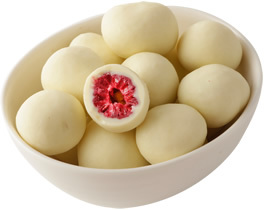 Sour sweet freeze dried raspberry is coated with white chocolate. Popular Nama Chocolate is standard good for Valentine Day’s event. 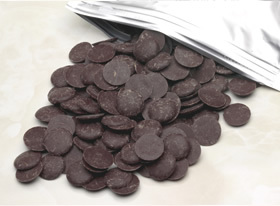 Flavor rich Iyokan peel from Ehime is gently coated with dark chocolate.